I say the cheapest way to enhance your wardrobe is to borrow from someone else’s, haha. (Word of advice: Never borrow a sister’s brand new pastel pink top and drop an inky black pen on it. It’s a bugger to remove–might as well just buy her a new top). 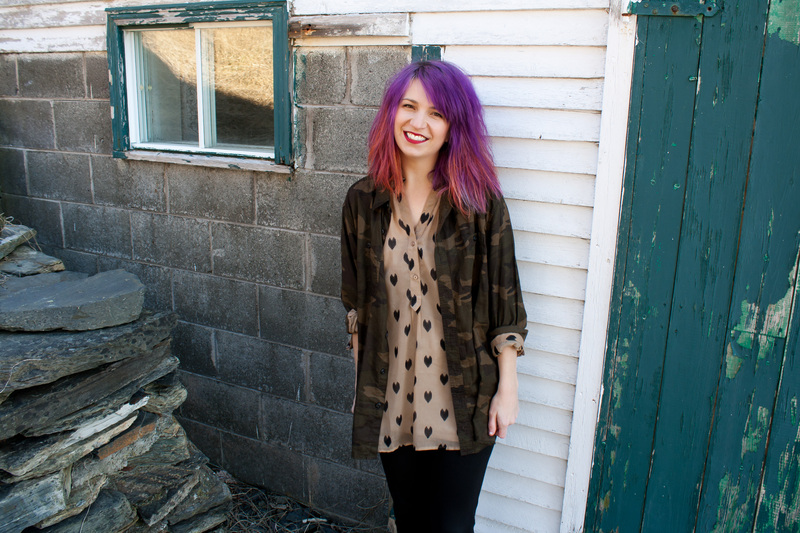 I borrowed this sheer printed top from Mom’s closet, and the thrifted mens camo shirt from Jess’ closet. Rolled the sleeves up together and DONE! Jess was given her oversized hooded shirt from a friend of ours 🙂 And yes, she wore the matching happy faces on purpose, haha. Halfway through the day she decided it looked like a pajama set. I haven’t worn pajama pants that tight since I was about 5 years old. Hi, really enjoyed going through your post! Super interesting, cool (and stylish- really cool second look!!) Keep it up! Come and check out my blog, if you get the time; I’d love to know what you think! I love how the mix of muted tones really makes your hair pop!